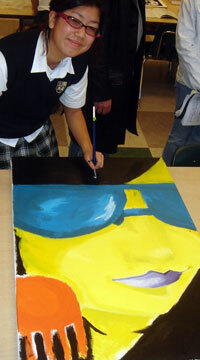 The NDPMA Visual Arts program offers a number of classes in both studio art technique and appreciation. Students explore a variety of mediums and materials to continually improve their individual artistic and creative abilities. Coursework includes intense instruction in various media as well as gallery and museum visits. Art students also have numerous opportunities to participate in artistic contests. Each spring, students produce works for exhibition at the school’s general public art show. Students enrolled in the International Baccalaureate art program also produce an art show in the spring. And, as students near graduation from NDPMA, faculty members in the Visual Arts department assist many students in portfolio development as they explore options at the university level and beyond.